A majority of the nation’s largest companies have set corporate targets that involve increased utilization of renewable energy and energy efficiency. While targets vary from company to company, one thing is true across the board: Meeting them has to make economic sense. Happily, as many companies have already discovered, investing in renewable energy and energy efficiency has a positive impact on the bottom line. Energy efficiency lowers energy use, thereby reducing costs; renewable energy offers stably-priced, long-term supply that protects against rising electricity costs. A number of renewable energy projects are already in place across North Carolina, and further growth presents a tremendous market opportunity that will drive additional investment and job creation. However, market barriers that prevent willing buyers and sellers from conducting transactions are stifling market growth in the renewables sector. 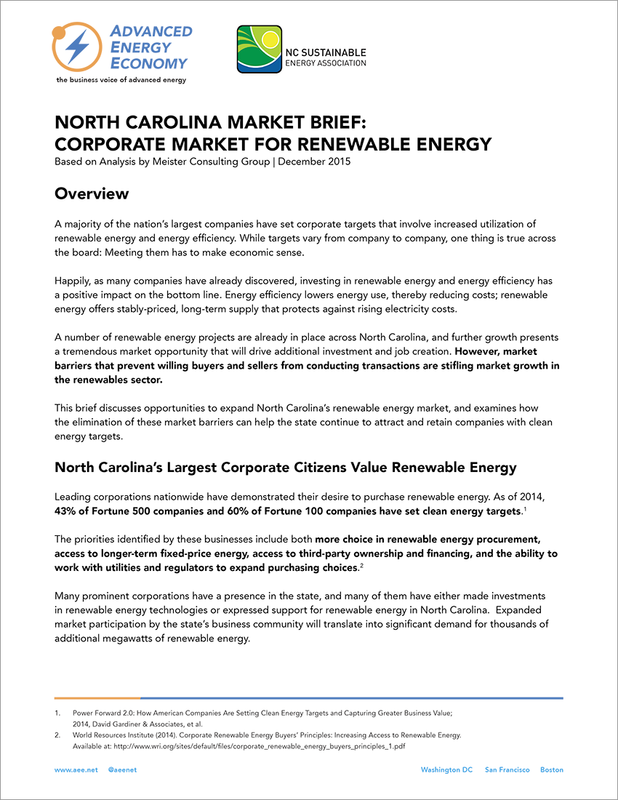 This brief discusses opportunities to expand North Carolina’s renewable energy market, and examines how the elimination of these market barriers can help the state continue to attract and retain companies with clean energy targets.